Two aspects of Exchange Server 2010 OWA received a lot of attention. First, Microsoft rebranded Outlook Web Access as Outlook Web App, but still refers to the interface as OWA. Second, the Options section of OWA is now the Exchange Control Panel. 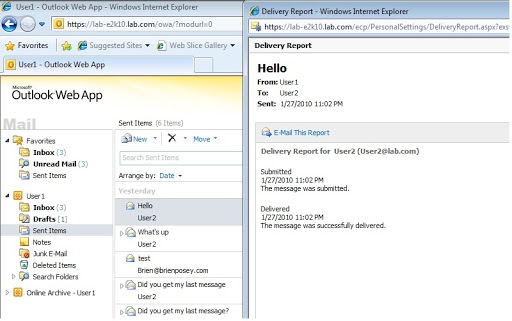 Exchange Server 2010 introduces a few significant new OWA features. 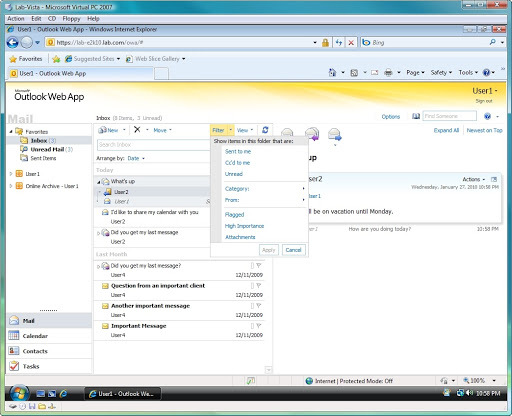 In Exchange Server 2007, the premium OWA client was designed for use with Internet Explorer 6.0 or higher. If you wanted to use an older version of IE or a non-Microsoft browser, you had to use OWA Light. 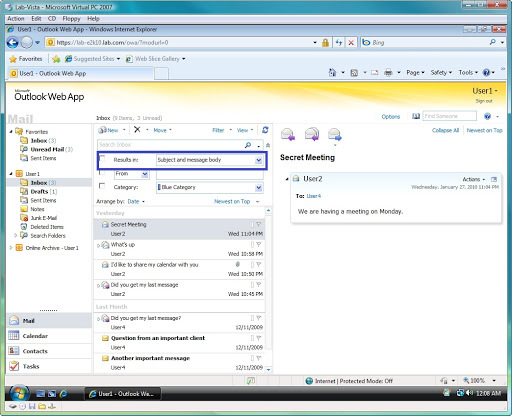 Outlook Web App 2010 allows cross-browser support; the premium OWA client is compatible with Mozilla Firefox and Apple Safari. This finally gives Mac users the full OWA experience. OWA can now display email conversations as conversation threads containing sent messages as well as received email, allowing users to keep track of responses (Figure 1). The entire thread can also be deleted or archived. Users also have the option to ignore the reminder of an ongoing conversation. Figure 1. OWA displays messages as conversation threads. When you begin typing an email address, OWA automatically displays possible matches (Figure 2). This is great when sending email messages to recipients who are not listed in your contacts. Figure 2. OWA 2010’s nickname cache automatically displays possible email address matches. Another great new feature in OWA is built-in message tracking. If a user wants to see if a message was delivered, they can go to their Sent Items folder, right-click on the message and choose the Open Delivery Report option. OWA will then display a delivery report for the message (Figure 3). Figure 3. 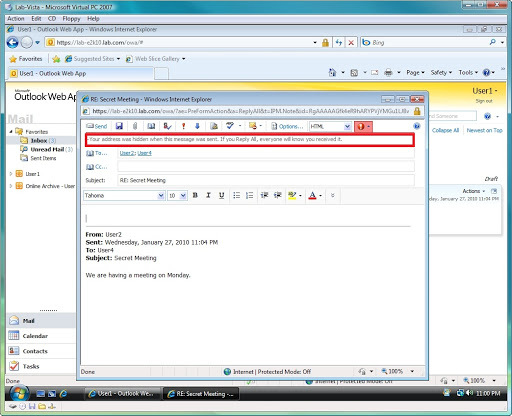 Users can perform message tracking in Outlook Web App. You can now perform searches by folder, sender/recipient, and message category (Figure 4). You also have the option of basing the results on either the message’s subject line or the entire message body. Figure 4. OWA now offers advanced search capabilities. The Mail Tips feature displays important information about an email message before users click Send. For example, we’ve all encountered instances in which someone clicked Reply to All to a message they were blind copied on. OWA now warns users before they commit this common email blunder (Figure 5). Figure 5. Mail Tips can save users from making common mistakes. The Mail Tips feature can give users additional email message guidance. For example, it can inform the sender if the intended recipient has enabled Out of Office Assistant. It also alerts a user when he or she is about to send a message to a large number of recipients. Message filtering gives users with large mailboxes the ability to view a subset of their messages. With this feature, users can filter mail to display only unread messages, or important messages or messages with attachments, for example (Figure 6). Figure 6. 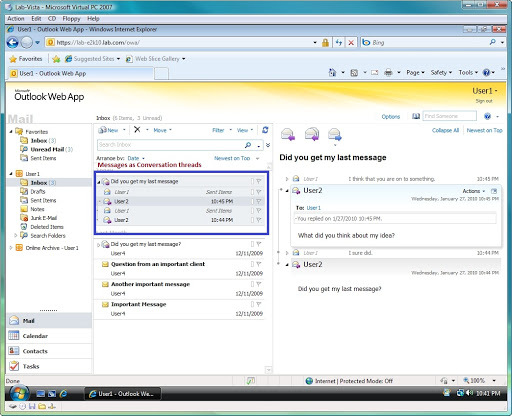 Filtering in OWA lets users filter inboxes to only see specific messages. As you can see in Figure 6, OWA has a section labeled Favorites, which is located in the upper left corner of the interface. One of the useful functions here is Unread Mail. Selecting this folder does the same thing as setting the unread mail filter does, but it actually saves a step. This shortcut lets users to view unread mail without having to create a filtered view every time they want to do this. This entry was posted in Exchange, Information and tagged Microsoft Exchange Server, New Outlook Web Access (OWA), New OWA in Exchange 2010, Outlook Web Access 2010, Outlook Web App, Outlook Web App features Exchange 2010. Bookmark the permalink.